Having set anchor just outside of Hope bay (we couldn’t find hoofing and guaranteed landing bay) it was a night of mixed fortunes. Some watches were both peaceful and stunning, sitting in the amber and yellow glow of an Antarctic night at 0300 watching shoals of penguins skipping through the water on their way home from a successful fishing trip (mine and Josh’s); to finding the boat getting pushed and pinned by a fairly sizeable berg, that said, this was not surprising when it was noted it occurred on the doom watch (Emily and Dan)! We were up and certainly not bright eyed and bushy tailed by 0800, the weather was calm, peaceful, clear, perfect conditions to be able to land on the Antarctic peninsula. A plan was hatched over breakfast, which included working out how to get a precision and unique, not to say inexpensive, chronometer (36kg) from boat to shore in a small rubber dingy (Zodiac) in one piece! 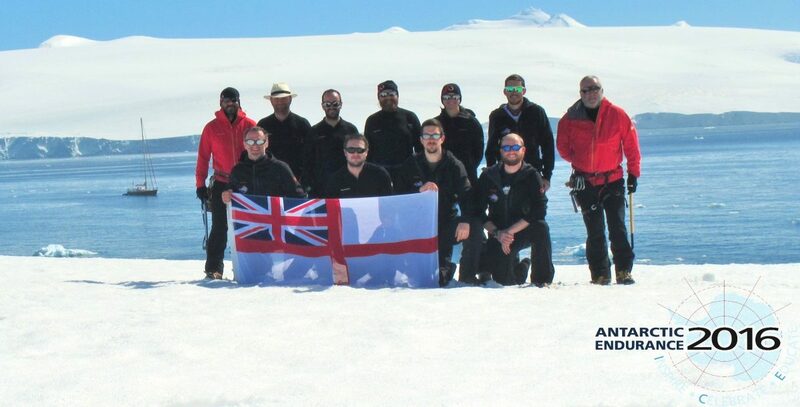 We decided to use the finest minds the Royal Navy and Marines have to tackle this difficult issue, however after searching the boat high and low we were forced to settle for the 11 on board, plus a wayward penguin (one tried to jump on in the night) and what appeared to be a disinterested fur seal! The result of this collaboration was that the penguin had a snooze, while it turned out the fur seal thought he was at an Antarctic ComiCon, which is understandable considering the company he was in and the fact he was convinced the penguin was the star of a Batman movie! However, we did come up with a plan, in fact so cunning you could cover it with a blanket and call it an Antarctic fox (review Blackadder if this makes no sense); and that was to be very, very careful and don’t drop it, particularly as we passed it over the side with 27 meters of uncharted waters below us, sensational planning – the Seal looked unconvinced! After an hour’s worth of frenetic activity getting the Zodiac engine out of the forepeak (storage area in the pointy bit at the front, for non-boaty people) and recovering and repacking all the mountaineering kit, we were ready for the off! The only final decision that needed to be made was to decide from within the team who was going to have the privilege of stepping onto the Peninsula first? This was decided in the now traditional AE16 means of decision making – rolling the dice. After nearly 36 years in the Corps, sitting around, generally lost, cold and miserable waiting for someone in charge to throw a double six for a decision; blow me Penguin over mate, Emily only went and did it, double six, first ashore, she was clearly very chuffed and excited at the prospect. The transits went smoothly, we took great care of the chronometer and it made it ashore in one piece; there wasn’t a rush forward at any point to be one of the blessed individuals tasked with being extra careful! Stepping onto the Peninsula was a surreal and emotional feeling, truly strange and humbling; everyone shook each other’s hands acknowledging this moment after two years of training and finally making selection. At the landing point we were greeted literally by two Adelie Penguins, completely un-phased and no more than 5 feet away, they seemed quite intrigued by these strange creatures in rubber boats and carrying aloft a box with what appeared to be a very, very big watch in it! The sky was blue, clear and crisp, to one side a glacier falling into the sea and a turquoise bay with ice bergs, nestled in the middle of which our current home, the Xplore. To the other side of the landing point was the Antarctic Sound, calm blue waters with penguins swimming and a seal sunning itself on an ice berg, as we took this in an ice berg floated into view jam packed with penguins; why that berg, was it a party or the Penguin equivalent of Carnival Cruises, who knew, who cared it was stunning anyway! The team then went into what can only be described as a period of Photo Frenzy; I’m not sure who took what, or who was in whose photos?! I think there is a very good chance that people were taking photos of them taking photos of them – you get my drift! Once the Doc had issued out some doses of sedatives and a reasonable balance of normal human behaviour was restored to the team, it was time to do some mountaineering revision and make best use of the weather. For the next few hours we readjusted the excellent and top notch kit supplied by Mammut, ran through roping up and crevasse rescue before taking a short trip while roped up. Once we dropped over the far side of the ridge we could look into the beautiful Hope Bay itself and see the Argentinian research centre. On return to the pickup point we bid farewell to the two Penguins, who continued to look at us with some confusion while we departed their snowy land, they didn’t even ask for the time! On return to the boat we have devastating news, the latest weather report show a stonking storm on its way, 50-60knt winds, in a small boat in this area of the World that news is something to take seriously. To that end we have adjusted the plan and are dashing back to South Shetlands (70 miles, ice permitting) to seek a relatively sheltered anchorage to wait out the storm before the next weather window. While starting this transit, as I write, we just saw a pod of Orca 30 feet on the starboard side shadowing us, 5 adults and a baby, it just gets better and better – until the storm, then it doesn’t! Comms will be difficult so if you don’t see a blog for a few days or without pictures that’s the reason why, we will be safe, just stuck playing dice and spoof with the Penguin and Seal until the next leg of our adventure.